In reality, Bale has been considered off-and-on recently for the role of Roland in The Dark Tower, although the role apparently recently went to Javier Bardem instead. The question is not whether or not Bale could portray Roland. Seriously, of course he could be Roland. This is young Roland, an angsty parallel universe knight cowboy. Contrast him with old Roland (pictured below), a stoic parallel universe knight cowboy who meets Stephen King, for some reason. This post is so far the first – and probably only ever – post in which I will argue that there is a potential film that not even Bale’s involvement could save. Quite simply, there is no good reason for The Dark Tower to be adapted into a film, and there are several very good reasons for why it shouldn’t be. For those of you not familiar with it, The Dark Tower is a seven book fantasy series by Stephen King which has an amazing first three installments before gradually disintegrating into cheap, Craven-esque meta-fiction, blatant promotion of King’s other novels, and full-blown plagiarism. 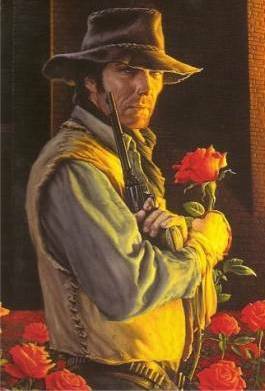 This is an older Roland, at the Dark Tower’s rose garden or something. Example: For some reason, the good guys all fight an army of Dr. Doom werewolves somewhere in the fifth or sixth book, and at another point they all gather around and read Stephen King books together. Then they meet Stephen King and Stephen King can’t believe that Roland looks just the way he imagined him, which is really cool, reading a Stephen King book about Stephen King meeting the main character of the book you were reading. 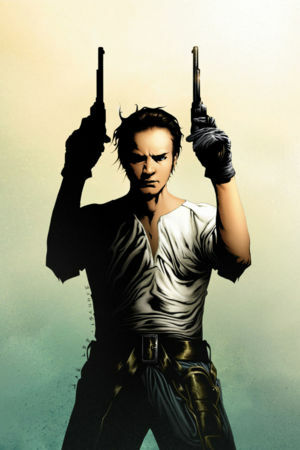 Anyway, my point is this: not even Bale can save a Dark Tower film series. Especially because they are discussing it being a trilogy of movies with different television series between each film. As long as they completely write Stephen King out of it, it might work. Because really, try considering some of the cameos Stephen King has made. The only one that you have maybe seen is Pet Semetary. Other than that, it’s Rose Red (a made-for-TV movie about a haunted house? ), The Storm of the Century (which does not star George Clooney and Mark Whalberg), Sleepwalkers (probably a 90s movies about vampires), and the made-for-TV miniseries called The Shining (yes, there’s another version of The Shining, which has nothing to do with Kubrick or Nicholson, and is not to be confused with the fake trailer for the comedy version of The Shining.) Now, if these are the films that he had cameos in, what disaster would happen if he had a major role? As himself? The only good thing is that the whole project would be such a disaster, you could be guaranteed that Bale would have a better meltdown than the Terminator one.